The stainless steel Vestil Pallet Washing Cabinet makes it easy to rinse, clean, and remove debris that can accumulate on plastic pallets. 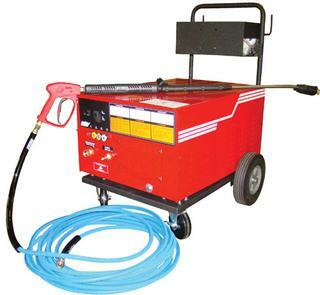 Constructed entirely of stainless steel, simply plug in your existing pressure washing hose using the snap connector provided. Minimal installation requirements include a connection to a minimum of 6GPM at 2500 PSI. With no moving parts, this washer is perfect for low volume applications involving slightly soiled pallets. A great choice to use with Vestil’s Pallet Washing Cabinet. Magnetic motor starter and industrial rocker on/off switch for pump motor with auto start/stop function. Stainless steel wand assembly with variable pressure, 4 quick disconnects, stainless steel nozzles and downstream detergent injector. 230V/240V, 3 phase AC power, 10HP motor.